You must be aware that, Pinterest launched Verified Websites for Pinterest profiles or profile pages. This is much similar like Twitter Verified accounts. But unlike Twitter, where to verify your account, you must reach some criteria, verification on Pinterest profiles for website does not have any such criteria. Anyone can verify website or blog. So everyone who have blog or website can add their own website or blog to the Pinterest profile page. Why verify your blog or website on Pinterest profile? UPDATE: Please go to the UPDATED METHOD 'Using Meta-Tag; directly bellow. This feature will allow you to tell your followers that you own the website and will also help you to showcase your website on your pinterest profile. But presently Pinterest only allow verification of website / blog through HTML file uploading given by Pinterest to your web server. This method is standard method but BLOGGER blog owner does not have this option. Blogger blog owners cannot upload any file to either the blogger or to their custom domain. Pinterest have promised to notify bloggers after this feature is enabled for blogger blog. Currently only Tumblr blogs only have this facility. But don't worry if you have a blogger blog. You can verify your blog even if you do not have the option to upload HTML file to your blog or blog server. Log in to your Pinterest account and go to Settings. Click on 'Verify website' button next to website option. You will be asked to download the HTML file for verification. Download this file to your hard disk. Now log in to your blogger blog and go to Blogger dashboard >> Pages >> Click on 'New Page' button. Here is an important trick. Open the HTML file that you have downloaded from Pinteret in Notepad. If you try to verify this page, Pinterest will not find this page and cannot verify your blog. Here you have to add the custom redirect to the verification page. So you have to redirect the URL expected by Pinterest to the page you have created. Observe the difference in the two URLs. The actual URL of the new page where the HTML file content is copied. Your addresses may be something different but the procedure is same. UPDATE: Note the difference:There is no p/ after your blog domain. The basic principle is, you have to forward the URL, where Pinterst try to look the page to the URL where you have actually saved the page. So you have to forward 'URL expected by Pinterest' to 'Actual URL' as given above. Enter the exact name of the HTML file into the 'From' field. This is very important, you have to copy name of HTML file you have downloaded to your computer and put it in to the 'From' field and a '/' without quotes before the file name as seen the image above. Enter the URL of the newly created page you have copied from 'Home' page of your blog WITHOUT the first part -in this case I removed http://www.toptrix.net- in the 'From' field. You have now verified blogger blog on your Pinterest profile. UPDATE: Pinterest have added a new and more easy way to verify your blogger blog. Instead of uploading the file to root of your domain, you just have to insert a 'Meta-Tag' to your blogger HTML template. This is very easy and can be done within a minute. You wont get any error. So here is a easy way. 1. After clicking on the verification button in your setting, when you get the option to 'Download HTML file' here is a new extra option, click on 'Can't upload a file? Verify with Meta Tag'. 2. Then it will show you a meta tag, you have to copy that meta tag and paste it in to the blogger html template. Copy the tag and go to your blogger dashboard >> Template >> and click on 'Edit HTML' button. IMP: Backup your template, before you do any editing in HTML, so that if something goes wrong, you can easily restore. Now find (Ctrl+F) the <head> in your template and paste the 'Meta-tag' you have copied form Pinterest, just after the <head> and 'Save' the template. 3. Now click on 'Click here to verify the process' link at Pinterest, and you will be greeted with confirmation message. I think, this new method is more easy and you should use this method. But when there was no such option at start when Pinterst first launched the verification option. Did you find this post useful? Please let me know.. Comment. =( I couldn't get this to work. Followed your directions precisely, as far as I can tell. If I do figure it out.after you verify..can you erase the page you created? I did it. I had to go back to edit my page and recopy the HTML into it again. After I re-did that, it worked fine. Thank you! Awesome, thanks! Worked like a charm. Is it OK to delete the page after verification? Once you have verified the ownership, you can easily delete the verification page. The verification remain there on pinterest profile page. Worked perfectly for Blogger today... verification completed. Hi Steph, When you downloaded the HTML file, try to open it with a Notepad if you are using windows. Just Right click on the downloaded file >> select Open With >> Select Notepad. The file should open and you get the HTML Code in Notepad. If the file is getting downloaded, it must contain the HTML code, it should not be empty file. I think you are missing something. Replace the word TopTrix with your pinterest profile name and copy paste the code. Try if it work and let me know. this is great thanks for the info. Having problems. It looks like you are using a domain name forwarded to your blogger account. How do you set it up in blogger to allow you to use that domain name in setting up the redirect in settings. I am using the custom domain and not at all forwarding. What error you are getting? great work sir!! Come up with more and more tweakings like this. amazing!! worked for me! thank you SO MUCH! Phenomenal instructions. Never in a million years would have figured this out on my own. Thank you so much. I will also add that I am mac, use TextEdit. I had to google and change some preferences to get the pinterest.html file to open up and show me the html code. That may have been the problem with the earlier commenter who couldn't see the code. Great! thank you so much, worked perfectly! Thank you so much! It works for my blog hosting on Blogspot! I couldn't get this to work to save my life!!! Wonderful job! Worked perfectly and your step-by-step instructions were easy to follow. Thank you!! Your server responded with a status code of 404 (file not found). We tried to visit the file at http://www.creatingathome.com/pinterest-b2dde.html. Help please? :) Thank you! ... just had to keep trying. It worked!! Cindy, I am getting the same error. Did you do anything different each time you tried, to get it to finally work? Also, is the name of the HTML file the same as the page title? getting "The source and destination values cannot be empty or more than 256 characters and must start with /." message every time! Hi Amanda, Catherine Dobbs, Marie, Magali Vaz, Manual Joseph, hillary rain, Carey, face final,Stacia, Tomate Joyeuse, Willem Karssenberg, Denyse, Heather L, Cindy, Valerie & Angraj. Very much thanks for your compliments. All are Welcome. Can you remove that page from your website once the site has been verified? Yes, Once you have verified your blog on pinterest profile, you can delete the page or the post without any problem and that will not create any problem. See, I have deleted it. Hi, I have a question...I have to paste the code in the Compose mode or in the HTML mode? I haven't been able to make this work, but I'll keep trying, thanks in advance! Hi Maria, The mode doesn't matter at all. You can use any way, but if you have some problem with compose mode, try using the HTML mode. It should work. All the Best. Your server responded with a status code of 404 (file not found). We tried to visit the file at http://myurl/pinterest-03a29.html. And my url has the www included, could that be the error? This is the problem about the URL you have provided at your Pinterest profile. If you have entered a naked URL i.e. without WWW at your Pinterest profile and you have saved the page at a closed URL that is www.yourblog.com then this may create error. For this you have to either forward naked domain to the closed subdomain at your domain registrar or at blogger settings. Yay! I´m doing my happy dance! For the record, I changed my naked URL on Pinterest and paste the HTML file in the Compose mode, in the HTML mode didn't work for me. Now I have my verified blog! Thank you so much! So I did everything as you said but I get this error message when trying to verify: "Could not find the code 0d9bfa042e9d12d28afe074756a4619b at url http://www.lemagnifiqueblog.com/pinterest-0d9bf.html"
Hi Damaris, When I tried to access your page directly, I got error 'The page does not Exist'. I think you have not created the page correctly. or you are missing something something in forwarding. Pravin I got soemthing similar. I ensured I created a page....but the the thing is, I have custom pages now on blogger so this may not exactly show up ont he site... could this be an issue?since it is a custom pages bar, would i need to go to someone who has more expertise? Otherwise your directions were super simple especially for someone who is not tech savvy at all. this was confusing, but I got it to work. File name is the name of file you you download form Pinterest. Just thanks. Great deduction. Very useful. 1. Your verification website address you have given at Pinterest. It should be exactly the same, if you have www in the site URL and have given necked URL at Pinterest, it will not work. 2. Check the 404 forwarding at Blogger settings. I will create a complete presentation for you in 2 days. Thank you so much! Took me a few times to get it to work; I had to post the HTML code in HTML mode instead of compose mode. Thanks a lot for this woohoo!! Plz Tut,verify this site for blogger! we are also have problem! You have to remove http://www.yourdomain.com/ from the URL you are pasting in 'from' and 'To' link because it is already there. I've followed your instructions up to the point where I am pasting the new URL in for the page I've created, but I don't actually know what it is I am pasting - where will I find the URL so that I can paste it? copy the URL of your newly created pinterest verification page, and paste the URL in 'From' field ( Without your base URL http://www.yourdomain.com/ because it is already there) in redirection settings. Thank you! Your tutorial was extremely helpful. couldn't get it to work. My blog address is a redirect to the blogger address. Is this why it didn't work? You can verify the blogger address also only if it is .COM. You can not verify if Blogger is redirecting the address to local country domain. Thats very bad, sorry for the problematic instruction but I am trying to making the tutorial more simple. Thanks for the help! It worked great! Should I change everything back to it's original setting once I have completed the process? Or will this mess up the verification? Yes, you can delete the things once you finish the pinterest profile verification. There will be no any problem. Thanks! I had to copy/paste the file contents twice to get it to work, but it did. Fantastic, thanks for the help! I've done the copying/pasting/everything! I even have the looks good page popping up on my blog...but when I try to finish the verification nothing happens with the Pinterest verification page...I couldn't get the HTML to download either, I used the .txt file you provided. Help! I can't get the verification page on pinterest to do anything at all. I used your html .txt page to get the code but now with the redirect I get a looking good page :http://vsstorytime.blogspot.com/p/html-public-w3cdtd-xhtml-1.html but still nothing from Pinterest. Thank you for this great tutorial! This helped me a lot. I was able to verify my blog (YourDailyBusinessInsight.blogspot.com) on my Pinterest page (https://pinterest.com/carlfillerup/). Pinterest just keeps saying "Verify" after I tweaked it a few times. It looks like it should be working, just can't get over that last step... any suggestions? Thanks for this tutorial!! What error you are exactly getting? not working for me. I got to the open the HOME on your blogger and all it is still giving me is the Pinterest download code. Everything worked fine up to there. You have to create a new page, not a downloadable file. What error you are getting? Do I want the published page to be literal html or interpreted html? Both is fine. Nothing is needed to publish. Its just for verification. Till I am trying to get verified but last step is not working , any other way ? I must be doing something wrong. WIll try again later. Thank you so much for the tutorial. Easy to follow and it worked! Thanks for your post to verify blogger blog to your pinterest profile. Nice work. 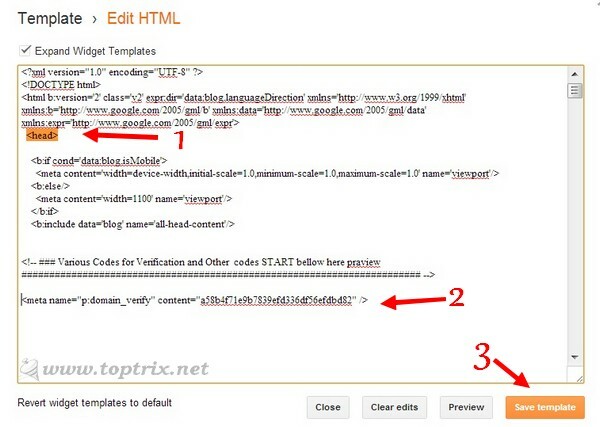 Here I have also shared how to verify Blogger/Blospot blog on Pinterst by Adding Meta Tag description. Used your meta tag work around - worked perfectly!! Thank you so much. Thank you for this meta tag workaround. Worked like a charm! sent you a mail. Deleting comment for privacy purpose. Never give your email address in comments. The contact details are at the top above the Header. Never mind I figured it out. Thanks so much for this. It was easier than I thought. I was just reading to much into it lol. Hi, Bento Kidz, Tanisha Lynne, Jesse Aston, Massimiliano Fattorini, Wasifa AhmadNo, RibenMerah, Julie Moore You are Welcome. Thanks, this worked for me. For some reason blogger didn't want to redirect, but I kept at it and finally got it. Great post and thanks to this I also figured out how to create a custom 404 page with blogger. Many Thanks. only name of the file which you have downloaded form pinterest in the 'From' field. That was hard, but I did it! Thank you! kindly start your from and to URL with "/"
mine was set like this and it was successful. This was so very useful! Done it. Thanks! Thanks for this. A great help. The file found at url http://www.myurl.net/pinterest-e9604.html does not appear to be the file downloaded in step 1. The server may be responding with a custom File Not Found page. I've re-done the copy into the Blogger page, both in Compose and HTML modes, and re-done the redirects, in 2 different browsers, but I still keep getting this message. I THINK I've followed the instructions properly. Any suggestions? If you are using a necked url on pinterest and you have a closed www alias on actual blog and vice versa. You have entered correct URL on pinterest. I'm getting the same error. "Does not appear to be the file in Step 1"
Same error here too. Both URL's are naked. :/ Pinterest can be so frustrating! Same error message for me, too. I've tried several times tonight. I'm deleting the Page I've created and the redirect and will start again later. If you have blogger with local domain means, blogger.in you can not verify. But still then you can enter blogger.com as your domain. Google will automatically forward it to local domain and will be verified. Enter a .com domain in pinterest and try to verify. Okay, so ignore my previous comment. It worked. I neglected to click the link on the Pinterest page to verify from the page shown in the screenshot. It's weird, because I was trying to verify it from the "Settings" menu in Pinterest. The settings menu says, "Verify Website", so I thought that was the only button I had to click. Turns out, the resulting page was hiding the true verification button (see screenshot from previous comment) the entire time. Actually, I figured out half this process on my own. I just couldn't figure out how to rename the page to the proper html page that Pinterest wanted. Thanks for figuring this all out for us! Thank you!! I've been trying to do this and failing all day. Your instructions were the only ones that worked. I followed your tutorial and it didn't work for me. I kept what I did through you because other sites recommended this procedure as well. The only different thing I did was to use this site, http://www.techclause.com/2012/11/verify-blogger-blog-on-pinterest.html, step 7 & 8 and it worked like a charm. I wonder if the fact that I'm not using a standard template on my blog affects how it works. Thanks for sharing, your instructions were clear and easy enough to do. Tried it, and it's not working :( I am also totally confused by this: "Now you should see the page into 'Home' of your blog" Could you clarify? Thanks so much! The particular page on blog is anything other than that home page address that is after the homepage address. To clarify, I keep getting the 404 error. I have updated the tutorial, please try using 'Meta tab' method. this will work for sure. Just a tip, when pasting the html code into a new post, make sure that you click "html" instead of "compose". That strung me up, but I think it will work now! I'm over my limit for verifications so I will try again later. 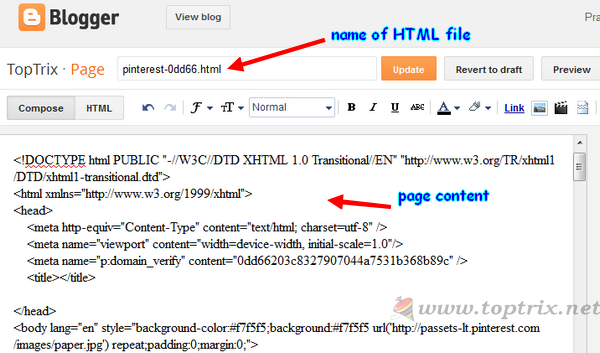 We found a file at url (my blog)/pinterest-cf433.html but it does not appear to be the file downloaded in step 1. The file may have been modified or the server may be responding with a custom File Not Found page. Please try again beginning with step 1.
omg. it's not even worth it to go thru all that crap just to have my blog listed on pinterest! thanx anyhow! im not getting a 'copy link location' option when i right click only 'copy link address' is this the same thing because the addresses are exactly the same and it doesn't seem to be working for me! I am sure I have followed your instructions perfectly. I have even tested the re-direct and it is working as it should. However, when Pinterest goes to verify, it isn't picking up the redirect to confirm the site. I keep getting the error message several others have suggested. Of course, now I have exceeded my limit of attempts and will have to try again later. After being locked out, I was given a new file to download, so I started the process over. After giving it some time, I am now getting the error message on Pinterest: We found a file at url http://www.sunscholars.com/pinterest-889e3.html but it does not appear to be the file downloaded in step 1. The file may have been modified or the server may be responding with a custom File Not Found page. Please try again beginning with step 1. I have gone through the process from the beginning several times with this same message. I have also tried with the downloaded code in "Compose" and in "html"... but same error message. Getting the same exact message as you. not sure what is wrong!! Hi....I am not using word...I am not sure how to open my download HTML in that case (no notepad to copy it from...) suggestions? Everyone who is getting any type of error, please try using the 'Meta Tag' based updated method. IT will work for sure. Thanks a ton! It went smoothly, great instructions! We were unable to verify your website. Click here to try again or visit support. Your server responded with a status code of 503. We tried to visit http://www.lambingan.net. I tried adding a new page and set the redirection but no sucess. this was extremely helpful....thanks I've struggeled with this for a week! Des explications claires, précises, qui m'ont permis (après bien des échecs) de remédier à mon problème ! dorénavant le lien de mon blog figure bien sur pinterest. Thank you so much for this update!!! I tried and tried the old way and just gave up. This new way with the meta tag insert was so easy! Very true. The first method is too much complecated but the second one is make the verification a breeze. The second one was released somewhat late. Hi, I tried the meta tag verification method but its not working. Does it take some time to verify? Hi, I am trying to verify with the meta tags method but its not working. Does it take time to verify like 1 day or so? Yes thank you so useful and helpful! It worked after I closed the meta tag. Thanks so much for the tutorial! You made this VERY EASY!!! Thank you for posting this. I have had many issues with trying to get this done. Again thank you! Thank you, thank you, thank you for sharing this! So helpful and saved me so much time trying to figure it out on my own. Ahhh thank you thank you! Meta tag isn't working for me even though I've done it several times. Now I'm over my verification limit. Seems like this just isn't even worth it. If I add a new page for the pinterest verification(HTML Method) will it affect the design of my template? Hi Joseph, There will be no any change ion your template. Only a small link on the navigation bar for newly created page will be added temporarily which you can remove after the verification. Hi i am getting message You're over your limit for website verifications. Try again later. Hello - I have multiple blogs on my blogger account. Is there a way for all of them to be verified until the one email account with pinterest? Do you know if there is a work around for this - to be able to verify one blogger blog and "all of them" under the one blogger account to be verified? Just curious! I don't think you can link multiple blogs to single Pinterest account. Because, once yo verify your first blog, the link to add other website or blog is not available. and you are done. There is only ONE box for verifying / linking the website.